When parents sign up kids for music lessons, probably first on the list of anticipated outcomes is that their youngsters’ lives will be enhanced and enriched by their involvement with music, possibly even leading to a lifelong love of music, whether the youngsters become performers (pro or amateur), teachers, or simply enthusiastic listeners, concert-goers, and music downloaders. Another perk that many parents may be counting on is the joy that they imagine they’ll feel while watching sons and daughters perform, whether at rough-edged but enthusiastic elementary school concerts or, later on, at more polished teen presentations. The soft glow of parental pride can help make the hard work of raising musical youngsters seem worthwhile, from the expense of music lessons to all the encouraging (and sometimes nagging) that’s required to nudge kids to practice, get to rehearsals on time, and not forget to bring their sheet music to all-county tryouts. However, there can also be some pleasant surprises that a music parent may never have imagined would occur, according to parents I interviewed on the ups and downs of music parenting. Kids can also experience unexpected, positive benefits from immersing themselves in music, including some that are nonmusical in nature. More on that later. Amy Nathan is an award-winning author of several books on music including The Music Parents’ Survival Guide: A Parent-to-Parent Conversation, and two earlier books for young people, The Young Musician’s Survival Guide: Tips From Teens and Pros, and Meet the Musicians: From Prodigy (or Not) to Pro. A Harvard graduate with master’s degrees from the Harvard Graduate School of Education and Columbia’s Teacher’s College, she is the mother of two musical sons: one a composer and the other a saxophone-playing political science graduate student. Read her previous OUPblog post. 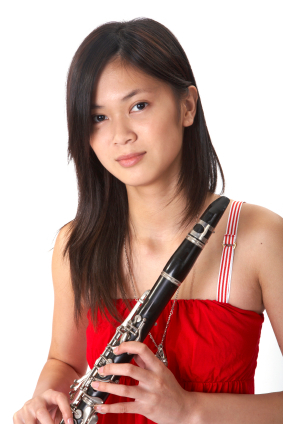 Image credit: A young Asian woman with her clarinet. Photo by tmarvin, iStockphoto.